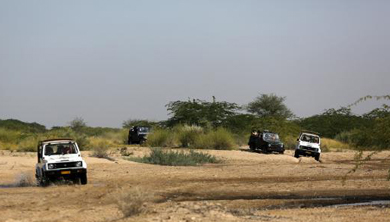 Bishnoi Village with Jeep Safari. Meet your guide in your hotel lobby. The safari tour was founded by Jodhpur’s Rajas and Maharajas, to offer a glimpse into the rich cultural life of this Marwa state, to Indian and foreign guests. 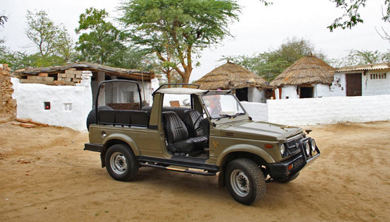 Bishnoi Village Safari is ideal for peeking into the life of tribal India. Marked with Khejri trees and deer, Bishnoi is a scenic village, where Lord Vishnu worshipping villagers, continue to worship nature and everything it has to offer. The naturally serene Guda Bishnoi Lake is an ideal picnic spot, where you can find various species of exotic migratory birds and endangered species of animals, like blackbucks and chinkaras. Nature is treated with utmost sanctity and everything living; plants and animals, are treated as holy beings. Villagers offer prayers to every plant and animal inhabiting this sacred piece of land. Despite being cut off from modern civilization, Bishnoi villagers make every effort to conserve their environment. After experiencing the customs and traditions of tribal life, it is time to be freed of the time warp and head back to your hotel where your trip concludes. Blue House Walking Tour in Old Jodhpur. On this carefully designed walking tour dive deep into the heart of Jodhpur to discover the lesser known treasures of this enchanting city. Learn about interesting legends from the past, peep into the life of locals, meet and interact with city’s residents, wonder through narrow alleyways dotted with Indigo colored houses. Led by our expert team of City Explorers this walking tour offers a great insight into majestic Marwar. 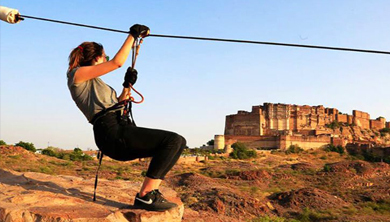 Zip Lining at Mehrangarh Fort. You fly high over the battlements and crenellations of Rajasthan's most majestic fortress, the Mehrangarh Fort. Truly of the most iconic zip tours in the world. Glide serenely over its two desert lakes, trek through the Rao Jodha eco-park and enjoy the best view of Mehrangarh and the Blue City of Jodhpur. Heena Painting & Turban Tying in Jodhpur. You will be taken to the local bazars of jodhpur to experience of the most fascinating things Heena painting (for women) & Turban tying (for Men). 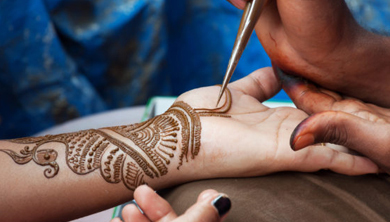 Heena is a dye being prepared from a plant is being used in all parts of India and nearby countries. It’s being used to dye hairs too. Designers make some designs on the hands & foot of ladies. It looks quite beautiful after its dries up and leaves the same design being painted. Turbans are a way of representing your clan and culture. Different designs, type, patterns & colors represent the community. You can try any one you want. In the end to conclude your day you can buy readymade turbans & dry Heena powder to take home as souvenirs. 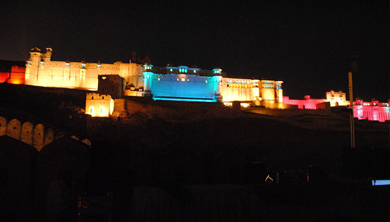 Sound & Light Show at Mehrangarh Fort. 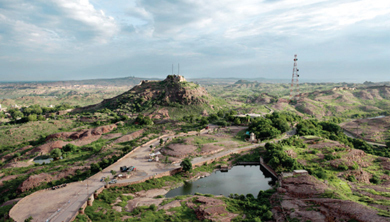 and it is situated at 150 feet high hill at a distance of 5 KM from Jodhpur. This fort is at a very nice location and you can see the entire city of Jodhpur from here. In the evening enjoy sound & light show. Bicycle Tour of Old Jodhpur. Experience this exciting and eco-friendly tour around the streets of Jodhpur. 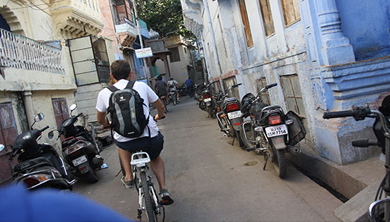 Go out for a 2 hrs cycling adventure around the alleys and the fort wall and get to know the different communities and its history. Here you will be introduced to the culture and life of today by our local site guide. 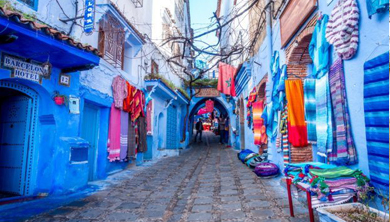 Cycle through the alleys of the old blue city and experience it coming to life as localities start their day. To see and learn more about Jodhpur’s history, its people and life, take this experience of cycling through Blue City. The tour offers a lot of stops for you to have both a relaxed and adventurous tour. 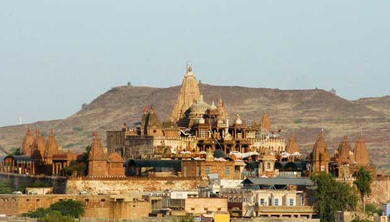 The tour offers you visit to historical landmarks around our part of Jodhpur as well as some of the hidden spots. This tour gives you the stories of the Royalties and how the Kingdom shifted from the days of ‘Ramayana’ to the present times, a taste of local food and drinks, close up experience of the “Marwari Cuisine’ will give you an insight of how they survived with whatever little they had. Along this trip our guide will also take you to the various ‘Step wells’ and ‘Jhalra’ and will share with you the back ground of the same which has become the travelers delight. Rental bicycle and a helmet. Osian Temple Visit With Camel Ride. Travel to Osian where you have the chance to independently visit the Sachiya Mata Temple. After visiting the temple, head to the starting point for the camel safari. The camel ride is considered a peak experience in Rajasthan. Expect to spend about one to two hours riding the camel in the Thar Desert. Desert Safari by Overlanded 4x4 Jeep with Lunch. lakes, dams, sand dunes, rocky surfaces, salt flats, etc.…. the convoy of vehicles will often stop at such a picturesque feature of daily picnic lunch which the tour leader carry in the vehicle. Rao Jodha Desert Park Walk. Rao Jodha Desert Rock Park was created in 2006 to try and restore the natural ecology of a large, rocky wasteland next to Mehrangarh Fort in Jodhpur. It had suffered years of neglect and was overrun by baavlia (Prosopis juliflora), an invasive, thorny shrub introduced from central America almost a century ago. The challenge was to eradicate the baavlia and create a suitable home for native rock-loving plants that we would bring back from the desert. Rao Jodha Desert Rock Park lies at the foot of Mehrangarh Fort in Jodhpur city, Rajasthan’s iconic and best known fort. The Park extends across 70 hectares – about 200 acres – of rocky land surrounding the fort. You can enter the Park from the Visitors Centre 800 metres from the main Fort Gate. You can also walk across the Park starting closer to the Fort or from several other points of entry.